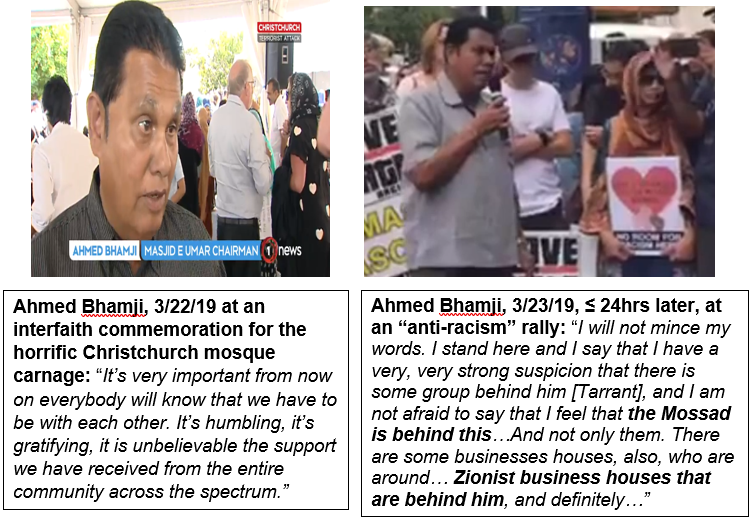 Last Friday (March 22, 2019), Ahmed Bhamji, Chairman of New Zealand’s largest mosque (Auckland’s Masjid Umar), shared a high profile platform where the contrite, hijab-clad New Zealand Prime Minister Jacinda Ardern also spoke. A tearful Mr. Bhamji uttered these conciliatory words at the interfaith solidarity event which commemorated the horrific Christchurch mosque carnage a week earlier. It’s very important from now on everybody will know that we have to be with each other. It’s humbling, it’s gratifying, it is unbelievable the support we have received from the entire community across the spectrum. 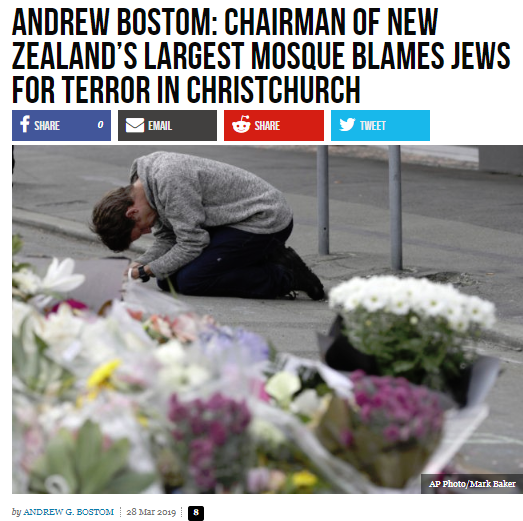 I am asking: Who was [the NZ mosque attacker] working for? The Christians are not hostile to the Muslims, as it is said in the Koran [5:82 ]: “You shall find the people strongest in enmity towards the believers to be the Jews and the polytheists, and you shall find the nearest among them in love to the believers to be those who say: ‘We are Christians.’” We are talking about a Christian country. So where did the Jews come from? We are not talking about Gaza. No, we are talking about Australia [sic; NZ]. As I’ve said before, this aggression [in NZ] was meant to incite Christians and Muslims against one another. The Jews are the ones who stand to gain. Even if the perpetrator was not Jewish, he was acting in the interest of the Jews, because he was fanning the flames of enmity between Christians and Muslims. The truth is that the Jews are enemies of both the Christians and the Muslims. They are the ones who claimed that they killed [Biblical prophets; Koran 2:61, 3:112 , 4:155 ] Christ, and they killed John the Baptist. Who tried to poison the Prophet of Islam [in the traditions and earliest pious Muslim biographies of Muhammad ] if not the Jews ? Sheikh Sahib is still “teaching” at Masjid at Taqwa in Auckland, NZ. Tragically, this dynamic of Jewish placation of Islam’s intrinsic, religiously-inspired Jew-hatred—an understandable survival tactic in 1172—persists despite dramatically changed circumstances some 850 years later, and regardless, but for the existence of Israel, would result in the destruction of Jewry by jihad.